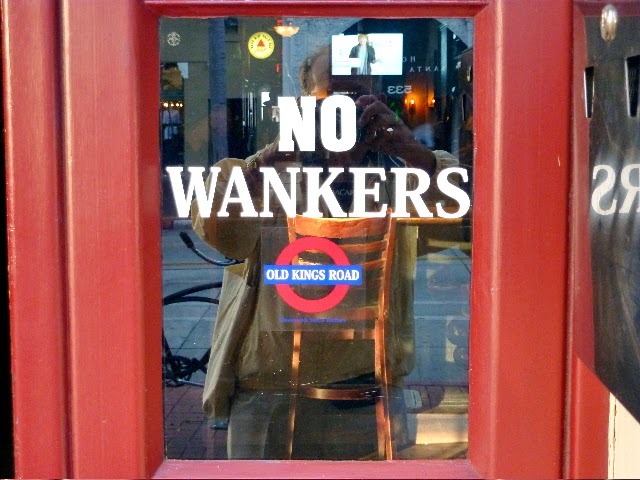 Today's photo of the entrance to the Old Kings Road 'English pub' in Santa Barbara, California by Tony R (that's his reflection in the window) arrives via Jon C.
Although I understand exactly what it means (I'm British), I'm also wondering how effective this sign could be. I mean, if you, er, truly qualify, you're not going to walk up to the door, read the sign, and steal away, surely? That really would be taking matters into your own hand, as it were. And the people whom it's really targeting (you know the type) won't recognise themselves as such in a million years. It's short and to the point though. I'd be tempted to have a drink there. Even if it was just to hold my own.